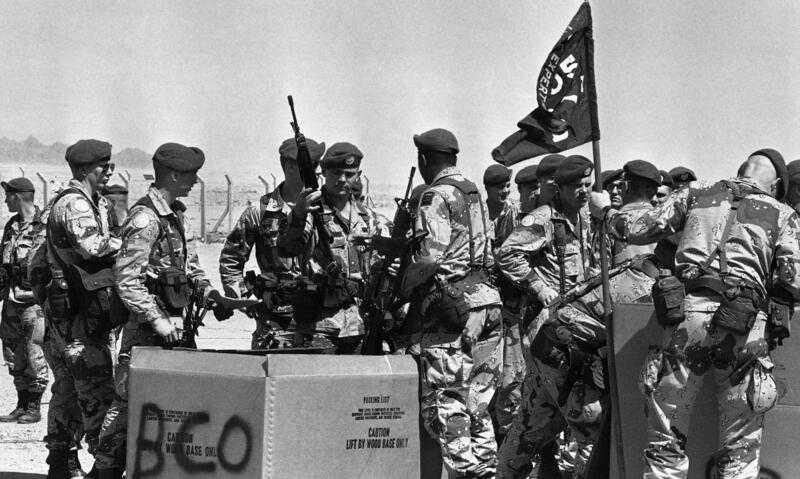 U.S. troops from the 82nd Airborne receive rifles in Sharm el-Sheikh, Egypt, in 1982. For decades, U.S. troops have been part of the multinational peacekeeping force in the Sinai Peninsula designed to ensure the peace treaty between Israel and Egypt. While the accord has held, extremists linked to ISIS now operate in the Sinai and are considered a threat to the Americans. Some 700 American troops on a long-running deployment could be in danger of an attack by extremists affiliated with the Islamic State, the Pentagon worries, but it may not be able to get them out anytime soon. U.S. military commanders fear the soldiers deployed in Egypt's Sinai Peninsula, and charged with keeping the peace between Egypt and Israel, are becoming an irresistible target for Islamist fighters concentrating nearby. The Wilayat Sinai group has pledged allegiance to ISIS, attacked Egyptian troops and planted roadside bombs. They have called the peacekeepers a "crusader force." The group dramatically raised its profile last November when it claimed responsibility for downing a Russian civilian plane filled with tourists over the Sinai, killing all 224 on board. In the Sinai, American soldiers are closer to ISIS than anywhere else in the world, one military official said. The official and others who talked with NPR asked not to be identified since the Defense Department hasn't decided officially whether to try to withdraw the troops from the Sinai. The U.S. troops are posted to two desert camps, part of an observer force in the Sinai created by the 1979 Camp David Accord between Israel and Egypt, which was brokered by President Carter. The peace treaty has held and the international detachment has had relatively little to do over the years in their desert outposts. There are just over 700 U.S. troops in the Sinai force, out of a total of more than 1,680 from 12 nations. The countries also include Australia, Canada, Colombia, the Czech Republic, Fiji, France, Italy, New Zealand, Norway, the United Kingdom and Uruguay. They rotate their troops in and out of Egypt for the mission. Since September, six troops – including four Americans – have been wounded during patrols. That month, the command removed personnel from a remote checkpoint three miles from a main base, saying it could not "safely resupply" the site and continue to conduct the mission. Over the past several months, the U.S. has beefed up security at the North Camp, which is squarely in the middle of the insurgency. Occasional rockets and mortars come into the camp, and there are fears the resupply aircraft could be under threat. Last fall, the Pentagon sent in more troops, armored vehicles, artillery and cameras mounted on aerostat balloons. Those are only defense measures, however. Outside the gate, in the Sinai itself, security is handled by the Egyptian military. An Egyptian tank outside the North Camp gate occasionally fires a tank round in response to fire by militants, U.S. officials say. If the Egyptians do go after the militants, these officials say, it often involves punishing attacks. But the Egyptians lack programs, like jobs or assistance, that could provide avenues to a better life and potentially blunt the insurgency. Back in November, U.S. officials tried to downsize the force during a meeting in Rome, where the peacekeeping force is headquartered. The U.S. delegates wanted to reduce the force by 20 percent and replace it with a variety of surveillance equipment. Both Egypt and Israel balked. For Israel, the U.S.-led force provides a certain comfort level, particularly at a time of rising tensions throughout the Middle East. The Muslim Brotherhood, an Islamist group, was elected in Egypt in 2012, but was overthrown a year later by the current leader, President Abdel Fattah al-Sissi. The Egyptian president and Israel share a strong opposition to Islamist groups. Daniel Byman, a professor of security studies at Georgetown University, said replacing U.S. troops with technology that could monitor the area is "eminently sensible" since it reduces risk. "You're able to sustain the mission better if there's less risk," he said. This isn't the first time grumblings about the Sinai mission have bubbled up out of the Pentagon. Former defense secretary Donald Rumsfeld twice tried to cut the deployments a decade ago, citing an overburdened military, but was rebuffed by both Egypt and Israel. The peacekeeping force, officially known as the Multinational Force and Observers, is just one of the ways the U.S. provides security assistance to Egypt. The overall package comes to $1.3 billion annually. The camps for the peacekeepers, one located in northern Sinai and another in the south near the resort town of Sharm el-Sheikh, employ some 400 Sinai residents. David M. Satterfield, who oversees the Multinational Force and Observers, is a retired career Foreign Service officer who served in Iraq and was U.S. ambassador to Lebanon. He was appointed as director general of the MFO by Egypt and Israel back in 2009. Satterfield's spokesman, Brad Lynch, declined to address the possibility of reducing the U.S. troop presence. "It hasn't been our policy for a long time to make comments on our peacekeeping force," Lynch said. Lynch referred all questions to the MFO headquarters in Rome. Officials did not respond to a request for comment. Geoffrey Aronson, an analyst with the Middle East Institute in Washington, wrote about the growing dangers in the Sinai on the institute's website last month. "The (Multinational Force and Observers) and in particular the United States, must now confront the unwelcome prospect of a kinetic engagement with ISIS in Sinai," he worte. "The Obama administration, thus, finds its options narrowed by the demands of its allies, increasing rather than reducing the number of boots on the ground, and hoping it will not be drawn into another open front with ISIS."